Welcome to the BNI Media Center! A massive four-year renovation was completed in 2018 to convert the BNI library into a full-fledged Media Center. The Media Center offers a collection of book titles, current copies of Time Magazine, The (NWI) Times, Post Tribune, and Chicago Tribune. It is equipped with 30 Chrome Books, with which students can access EBSCOhost for academic research, Follett Destiny for our online card catalogue, and Google Apps to check E-mail, perform online searches, or complete and print classroom assignments. This learning space's additions include more functional furniture with charging stations, private group study rooms with the latest technology, classroom space, and new space for books. Phase one included physical upgrades including new carpeting, new ceilings, new lighting and fresh paint throughout. Phase two saw the addition of six individual group meeting rooms and one large classroom, equipped with furniture and technology. Glass walls and doors were constructed for each of these rooms. Phase three included the addition of new modern furniture and upgraded technology. 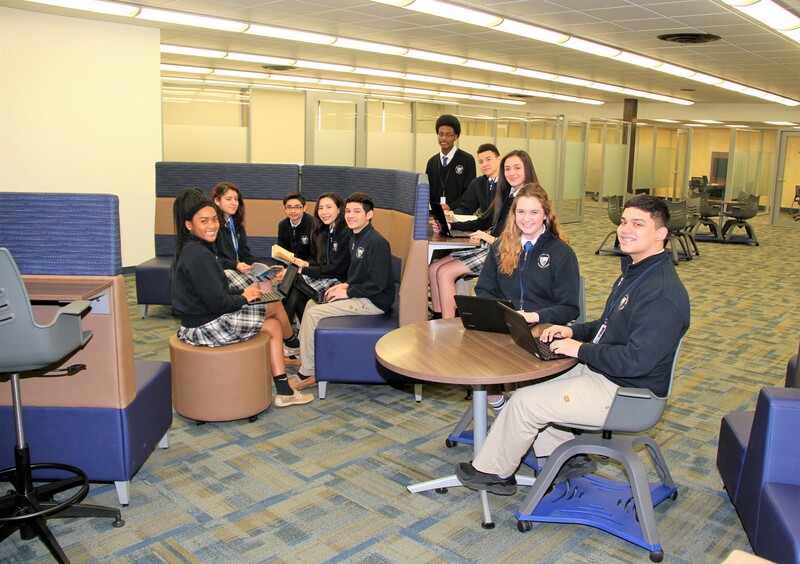 “The overall goal was to provide students and faculty with a modern learning environment,” said Mary Ellen O’Neill, Bishop Noll’s director of advancement. The space focuses on technical competence, collaborative work processes and creative and critical thinking that prepares our students for challenging college and careers.